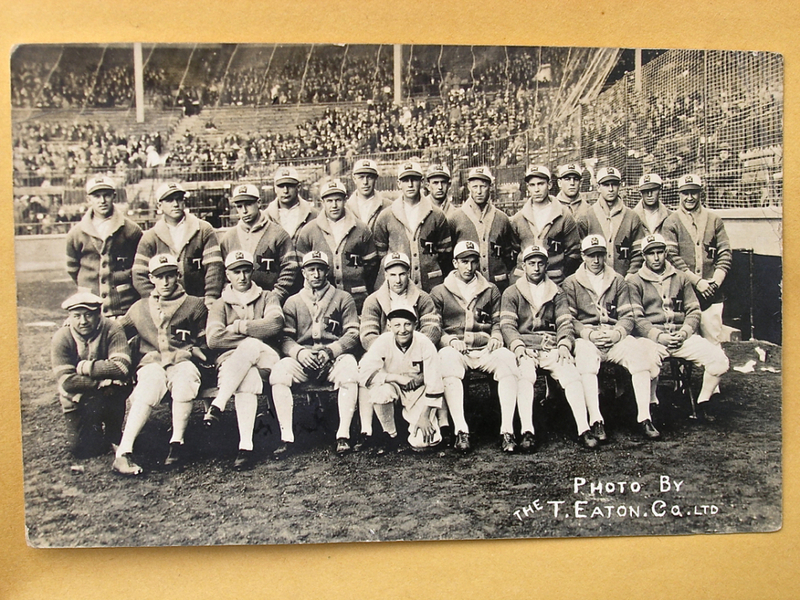 This is a postcard of the 1926 Junior World Series champion Toronto Maple Leafs that recently sold on eBay (Auction Link: http://is.gd/J8P4gV). Hall of Famer Carl Hubbell, who would go on to win 253 big league games, pitched for this Leafs squad and is pictured in the front row, fourth from the left.  A thank you goes out to Facebook friend Sue Rennie, who shared a photo of an extraordinary 1926 Toronto Maple Leafs team postcard (pictured above) that sold for $881.08 on eBay on October 21. The postcard of the International League and Junior World Series champion Leafs squad is particularly significant because it features Hall of Fame left-hander Carl Hubbell (front row, fourth from the left). Hubbell honed his skills with the Leafs in 1926, before winning 253 major league games with the New York Giants from 1928 to 1943. The eBay seller indicates that this postcard came directly from the estate of Walter “Lefty” Stewart, who also played on the 1926 Leafs (back row, seventh from the left). Hubbell and Stewart (then with the Washington Senators) would later pitch against each other in Game 1 of the 1933 World Series.  An industrious big league general manager could fill four-fifths of their rotation with Canadians this off-season. Ryan Dempster (Gibsons, B.C. ), Erik Bedard (Navan, Ont. ), Jeff Francis (Vancouver, B.C.) and Rich Harden (Victoria, B.C.) are all free agents, while Russell Martin (Montreal, Que.) is also available to catch them.  Les Mueller, one of the last living members of the 1945 World Series champion Detroit Tigers, passed away on October 25 in Belleville, Mo., at the age of 93. His only prolonged major league stint came in 1945 when he recorded a 3.68 ERA in 26 regular season games. But in one of those games against the Philadelphia Athletics on July 21, he hurled 19-2/3 innings, allowing 13 hits and no earned runs. He finished that contest with a no-decision. Wow! Thanks for access to that footage. It was really great. Thanks for the comment. Yeah, the footage is amazing. Kevin: I lived in Huntsville for a number of years and I only remember hearing or seeing anything about George Selkirk once or twice. I believe there is some kind of plaque in the Town’s Athletic & Recreation Complex. In case you ever want to dig a bit, the oldest town newspaper in Huntsville is the Huntsville Forester. It is has been around forever. The Forester would be the best starting point if you wanted to find anyone in town who even knew anything about Selkirk. The town library also has an excellent librarian who could be of help. My wife has family up there. The next time I go up there, I will try to ask around a bit and look around a bit to see if there is anything to remember Mr. Selkirk. Baseball was not a big sport in Huntsville when I lived there in the nineties. You have really piqued my interest with they video and stories about him. Huntsville is a small town and I’m quite shocked that that there is not more there to remember him by. BTW: Tony Clement is the MP for the area. I don’t know if he is a baseball fan but I know he has spent a lot of time and money as the MP for Parry-Sound Muskoka promoting the area. I wonder if he would be interested in the trivia. Thanks, David. I did make contact with the Huntsville Forester a few years ago. I will touch base again soon. That would be great if you could ask around the next time you’re in Huntsville. Thanks again. Video of Selkirk homering, let alone off of King Carl is absolutely astounding. Fantastic post! Thanks for the note, Lando. Yes, it’s hard to believe that video surfaced on YouTube, but I’m glad that it did. Really enjoying the George Selkirk information! Amazing footage of Selkirk’s home run also.